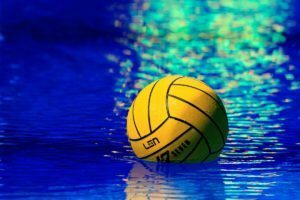 St. Francis Brooklyn’s Kelsey Snelgar put in eight goals in the Terriers’ 24-3 win over Connecticut College and followed that up with a six-goal effort in a 32-3 win over Utica College on Sunday to lead all scoring efforts on Water Polo Week 8. Presley Woods netted six goals in Austin College’s 14-6 win over Connecticut College on Tuesday. Brooklynn Hayes notched three goals for the Camels in the loss. Maud Megens dropped in five goals as #1 USC picked up a 12-8 road win at #5 Hawaii. Irene Gonzalez countered with a hat trick for the Rainbow Wahine. 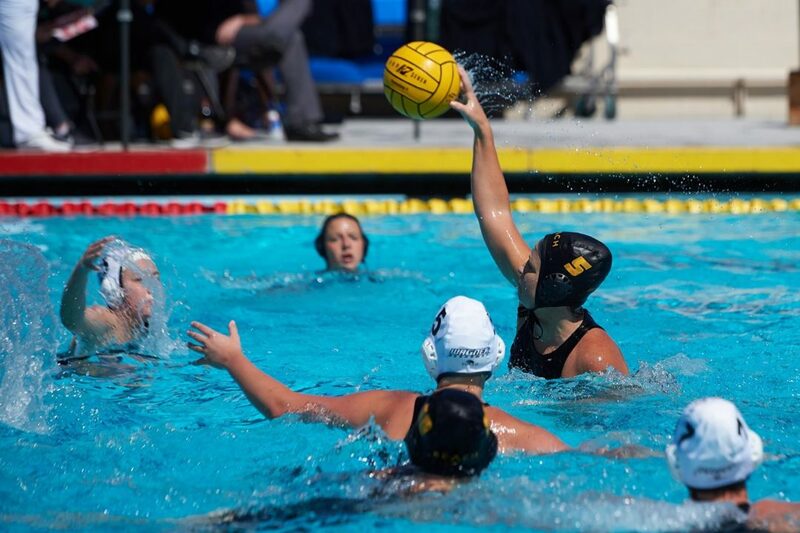 #15 Long Beach State’s Sarah Barker recorded five goals in a 13-7 win over #16 Wagner on Sunday and added four more in a 15-6 victory over RV Bucknell on Thursday. Orsi Hertzka notched a hat trick against Wagner, while Marilia Eleni Mimidi scored four times for the 49ers against Bucknell. Olivia Grim led the way for the 49ers with a hat trick in its 10-8 win over #18 Cal State Northridge on Saturday. 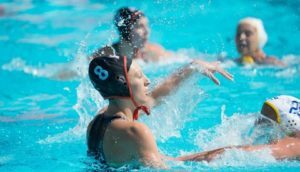 Cal State Northridge’s Tori Wilson netted eight goals on the Tuesday in wins over Connecticut College (13-2) and Austin College (20-3). Wilson put in three goals in the first game and added five more in the night cap. Yuri Cowie added a hat trick in the latter contest. Later in the week, Madasonne Butler came up with a hat trick in a 10-8 loss to #15 Long Beach State. Morgan Malloy notched five goals and Hana Vilanova added four, with each scoring in overtime, as #12 Loyola Marymount crept past #13 Wagner 15-13 on Friday. Later in the day, Vilanova and Marialena Seletopoulou each added a hat trick as the Lions topped RV Bucknell 10-8. On Saturday, Malloy chipped in a hat trick in both of LMU’s victories, a 10-6 win over #20 Marist and a 10-7 win over #14 Princeton. Seletopoulou also put in three goals in the win over the Tigers to cap a 4-0 weekend at home. Olga Descalzi Portell scored five goals and Matilda Moore added three as #19 San Jose State upset #14 Princeton on Friday. Lili Urvari scored four times and Descalzi Portell added a hat trick as the Spartans were upset by #20 Marist 10-9. Descalzi Portell added four more goals to her tally in San Jose State’s 14-11 loss to #16 Wagner on Saturday, while Urvari knocked in three goals as SJSU fell to RV Bucknell, 10-9. Erica Hardy put in four goals for #16 Wagner and Sofia Diaz Alvarez added a hat trick in a 15-13 overtime loss to #12 Loyola Marymount on Friday. Kristy Donkin and Daisy Nankervis score three goals apiece as the team edged past #20 Marist 11-10. Diaz Alvarez added four more goals alongside Jacqui Sjogren in the Seahawks’ 14-4 win over Cal State East Bay on Saturday as Hardy scored a hat trick. Nankervis, Malia Josephson and Diaz Alvarez scored three goals each in Wagner’s 14-12 win over #19 San Jose State to wrap the team’s efforts at the LMU Invite. Josephson finished the weekend with another hat trick in a 13-7 loss to #13 Long Beach State on Sunday. #6 Michigan’s Maddy Steere notched four goals and Julia Seller and Abby Andrews chimed in with three apiece in a 17-7 win at #13 Fresno State. Steere added three goals in the team’s 8-7 win at #7 Pacific, while Andrew added three more 11-7 loss to #4 Cal on Sunday. #13 Fresno State’s Emily Nicholson was 4-for-4 in the team’s 18-8 win over George Washington on Wednesday, while Callie Woodruff and Trystyn Vuori turned in hat tricks. #14 Princeton saw Eliza Britt net four goals and Kailie McGeoy add three in an 11-9 loss to #19 San Jose State on Friday. The Tigers got hat tricks from Lauren Larkin and Amy Castellano in their 13-9 win vs. Pomona-Pitzer on Saturday. Ally Furano netted four goals as RV Bucknell fell to #12 Long Beach State 15-6. Furano also scored four goals for Bucknell in a 10-9 upset of #19 San Jose State on Saturday, while Kali Hyham added three scores. Gannon’s Kelly Fehr had four goals on five shots in an 11-9 loss to Saint Francis (PA) on Saturday. 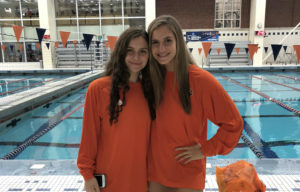 Connecticut College’s Marissa Moreno and Cal Tech’s Katie Johnston each scored four goals in the teams’ Wednesday matchup, while Moreno’s teammate Ali Keenan added three scores. Johnston’s Beavers won 13-12. Stephania Lopez put in five goals later in the week as Connecticut College fell to Chapman 17-9. LaVerne’s Jassmine Kezman and Ilene Guerrero put in four goals each against Cal Lutheran on Tuesday, but it was not enough in the 13-12 loss. Nikki Roed and Mardell Ramirez scored three goals apiece for the Regals in the victory. Christin Hirn and Mackenzie Thomas paced Cal Lutheran with four and three goals respectively as the team bested Chapman 16-5 on Saturday. Argelia Diaz turned in three goals for Chapman in the loss. Diaz also added a hat trick alongside Alyssa Caltagirone in the Panthers’ 17-9 win on Thursday. Pomona-Pitzer got four goals from Nadia Paquin in a 12-7 victory over Cal Lutheran on Thursday. Cal State East Bay had three players score at least three goals in the team’s 16-9 win over George Washington on Wednesday. Adrien Van Dyke led the way with four scores, while Brittany Smith and Auriel Bill added three apiece. 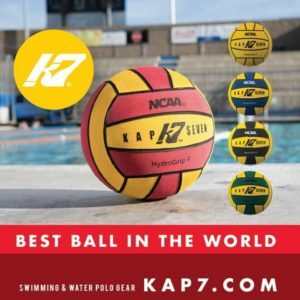 Bente Rogge notched a hat trick on Thursday as #8 Arizona State bested #22 Indiana 10-5. She added another three-goal effort on Saturday as the Sun Devils fell to #3 UCLA 12-9. Lizette Rozeboom and Maddie Musselman each put in three goals in the Bruins’ win over ASU. Rozeboom also notched three scores as UCLA topped #22 Indiana 16-2 on Saturday. Chloe Robinson and Kathleen Schafle paced #11 UC Davis with three goals apiece in the Aggies’ 10-7 win over #18 Harvard on Saturday. Kristen Hong managed three scores for the Crimson. Brigit Mulder put in three goals amongst seven scorers for #4 Cal as the Bears registered an 11-7 win over #6 Michigan on Saturday. Mulder notched two of the final three goals in the match as Cal rallied from down 7-6 to grab the win. Claremont-Mudd-Scripps got three goals from Aracelia Aldrete in its 7-6 road win over Redlands on Tuesday in SCIAC play. Sawyer Bellville put in three goals to lead all scorers for Whittier in a 7-6 win over Claremont-Mudd-Scripps on Thursday. Bellville also posted a hat trick alongside Emma Romero in a 19-3 win over Cal Tech on Tuesday. The Poets got three goals from Teresa Marchetti in a 13-4 win over Occidental on Saturday morning. Dailynn Santoro notched a hat trick in Concordia (CA)’s 14-4 win over Austin College on Wednesday. Monica Chernoff scored three of Occidental’s five goals in a 5-4 win over Austin College on Wednesday. 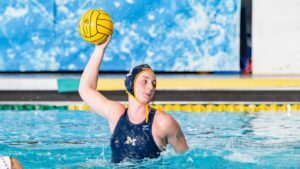 Player of the Week: Maddy Steere, Michigan – Posted eight goals, four assists, two field blocks and a steal as the Wolverines went 2-1 in California last week; notched four goals and two assists in a 17-7 win at #13 Fresno State; added three goals, one assist and two field blocks in 8-7 win at #7 Pacific; accounted for one goal, one assist and one steal in 11-7 loss to #4 Cal. Player of the Week: Marialena Seletopoulou, Loyola Marymount – Scored at least two goals per game as the Lions went 4-0 at the their home LMU Invite; totaled five goals on each day of the tournament; recorded a .556 shooting percentage. Offensive Player of the Week: Kelsey Snelgar, St. Francis Brooklyn – Turned in 21 points (14 goals and seven assists) in wins over Connecticut College (24-3) and Utica (32-3); notched eight goals and three assists in the first match and added six scores and four assists in the second. Newcomer of the Week: Alejandra Aznar, USC – scored twice and earned a 5-meter penalty shot in the road win over #5 Hawaii; her first goal put USC up 5-2 and her second made it 12-5; the 5-meter penalty shot she earned helped USC to its fourth goal in a 7-0 mid-game surge. Offensive Athlete of the Week: Sawyer Bellville, Whittier – Notched eight goals, six assists and five steals in wins over Cal Tech (19-3), Claremont-Mudd-Scripps (7-6) and Occidental (13-4); posted hat tricks against Cal Tech and CMS. Player of the Week: Kelly Fehr, Gannon – Scored seven goals and drew five exclusions in matches against Mercyhurst and Saint Francis (PA); put in two goals and added an assist and a steal in a 7-5 win over Mercyhurst; had four goals on five shots and registered two blocks in an 11-9 loss to the Red Flash.